LONDON (Feb 27): Sterling fell broadly against major currencies on Monday, as the prospect of another Scottish independence vote and signs a major merger was unlikely to go through renewed fears about Britain's future as it prepares to leave the European Union. A report in the Times newspaper said British prime minister Theresa May is preparing for Scotland to call a fresh independence referendum in March. The Telegraph newspaper meanwhile reported that May is planning to curb freedom of movement for EU citizens as soon as she triggers Article 50 — Britain's formal notification to leave the European Union. The London Stock Exchange on Sunday all but ended a planned merger with Deutsche Boerse by ruling out meeting a European anti-trust demand, saying it has strong prospects alone. Sterling slid by as much as 0.7% to US$1.2384, its lowest in nearly a fortnight. It last traded down 0.3% at US$1.2431. It also fell 0.5% to 85.15 pence per euro. "One of the reasons [sterling is down], is the announcement that the merger between LSE and Deutsche Boerse may be off the table and I think that's flagged sentiment," said Richard Cochinos, European head of G10 currency strategy at Citi. An adviser to the devolved Edinburgh government said last week that it is increasingly convinced it can win a new independence referendum and is thinking seriously about calling one next year as Britain leaves the EU. 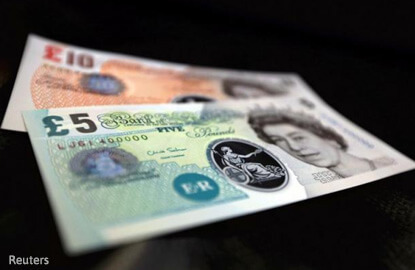 The pound had its strongest week last week since January on Friday, as a lack of major domestic developments in Britain saw investors' attention drawn to the US economy and European politics, giving sterling some respite. "On top of soft data from the UK recently ... these fresh signals of a 'hard Brexit' and the risk of another Scottish referendum, enhances our view that the broader outlook for sterling remains negative," analysts from retail broker IronFX said in a note to clients. "Our favorite proxy for any potential sterling softness in the foreseeable future is still sterling/yen, considering that the looming political risks in Eurozone could strengthen the yen due to its safe haven status."